The following organisms were found by a famished, 1st year veterinary student at Oklahoma State University while eating a cooked filet of wild caught sockeye salmon, appropriately on the day of her Parasitology final. She removed the organisms with her fork and saved them for her Parasitology professors. 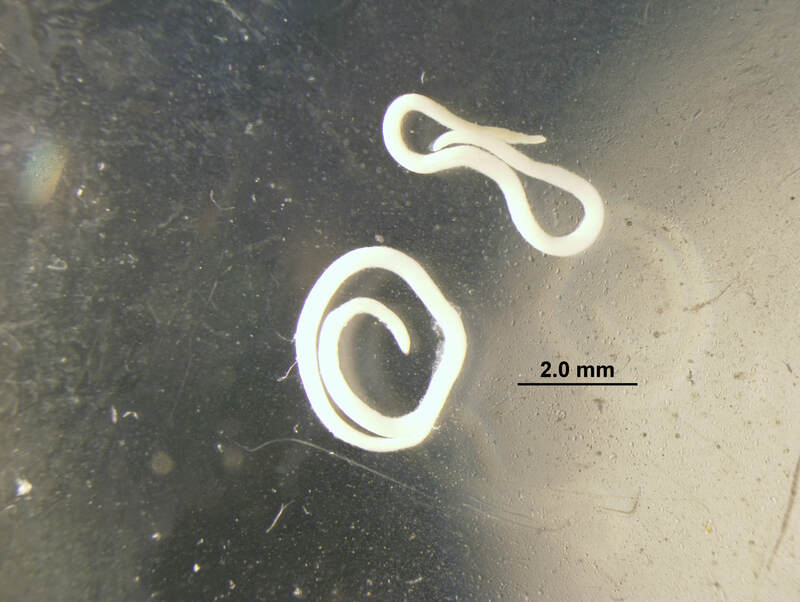 Based on where these parasites were found and gross overall morphology, they are likely larvae of Anisakis sp. or Pseudoterranova sp. Larval anisakids are common in marine and anadromous fish (migrate from salt water to fresh water to spawn). Adults of this parasite reside in the stomach mucosa of marine mammals. Eggs are passed in the feces, embryonate in water, and free-swimming larvae hatch out. These larvae are ingested by crustaceans and become third-stage larvae that are infective to fish and squid ingesting them. Ingested larvae migrate from the intestine to the peritoneal cavity; upon the host’s death, the larvae migrate to muscle tissue. Through predation, this parasite is transferred from fish to fish. Anisakiasis in humans can result when parasite larvae are ingested and attach to the esophageal, stomach, or intestinal wall. Nausea and vomiting, abdominal pain and distension, diarrhea, bloody/mucoid stool, and mild fever are reported symptoms. The condition can be prevented by cooking fish to an internal temperature of at least 145°F (63°C). Certain freezing protocols are also effective at killing the parasite in tissues of infected fish.